Image taken at the yard at Electric City. 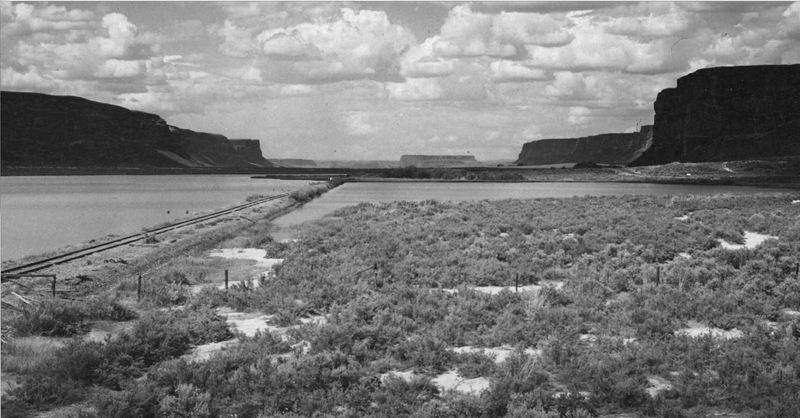 In the 1947 photo, the feeder canal has not been dug out yet. 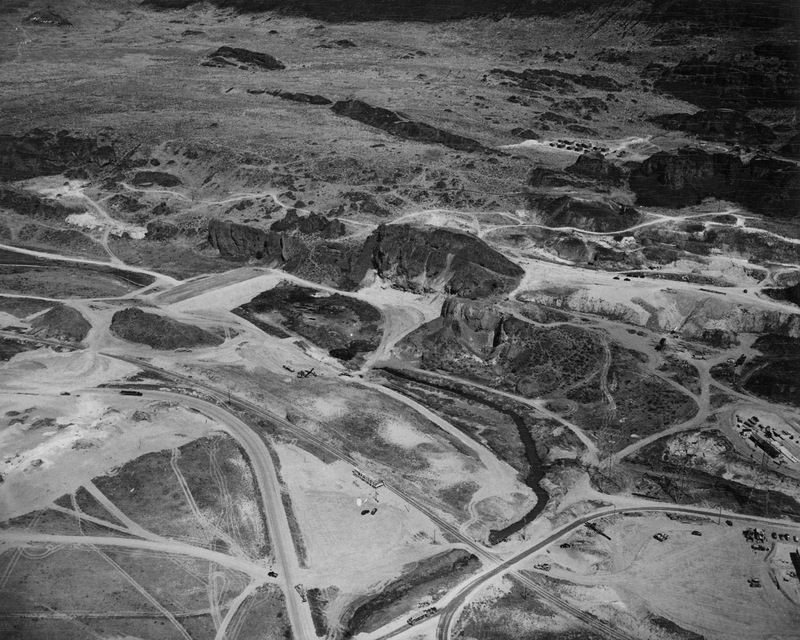 To properly orient yourself between the two photos, the housing seen to the right of upper center, with the adjacent lobe of basalt are still in place above the canal today. A lot of the basalt seen in the older photo is just plain gone today, or under water. Courtesy of the University of Idaho, who had this image labeled incorrectly. Not sure who to credit for this, as I just came across it all these years later. If you know, drop me a line and I'll update this to credit the author. 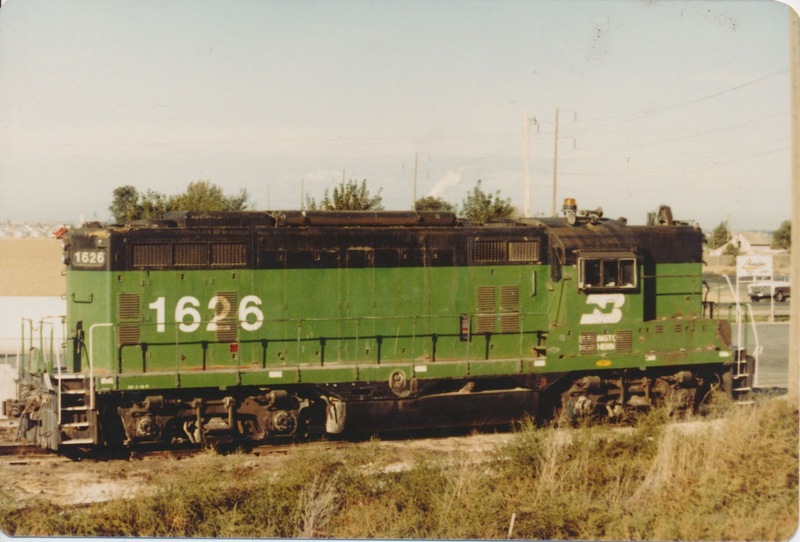 With all the discussion about CW and P&L branches lately, and with a public hearing looming Friday I thought a little history of Watco was in order. After being little more than an industrial switching company in the northwest for many years (Wallula, WA and East Helena, MT) Watco enters the northwest shortline picture big time on Nov. 20, 1992 with the purchase of several Union Pacific branch lines in Eastern Washington and Northern Idaho. These lines include Hooper Jct. WA to Winona to Thornton, WA, Winona to Colfax, Pullman, WA. and Moscow Idaho. 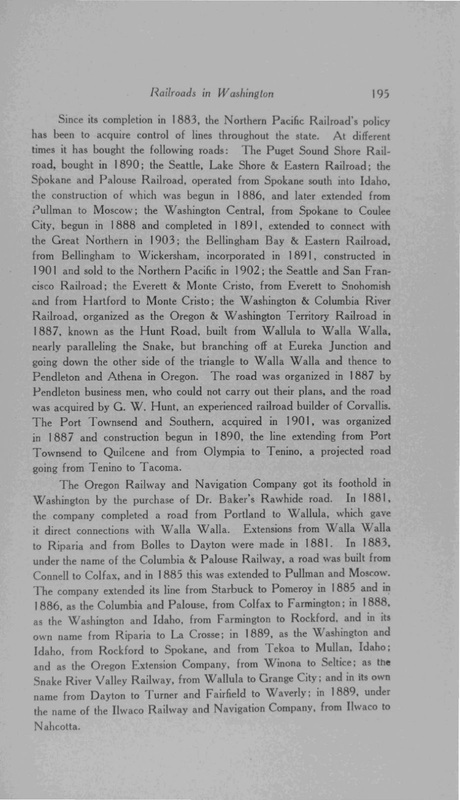 And the Purchase/Lease of Wallula-Walla Walla-Dayton-Walair, WA lines and the Walla Walla to Weston, OR. line. Soon after arriving on the scene, the branch to Weston gets closed, and the branch to Dayton gets sold off to local county governments so that goverment funded track rehab. can take place. Later, the State of Oregon comes up with money to rehab and reopen the Weston Branch. Local governments in conjunction with Washington State Department of Transportation start the state grain train program, with Watco's carshop in the Port of Pasco getting the contract to do the work on the well used cars purchased by the state. 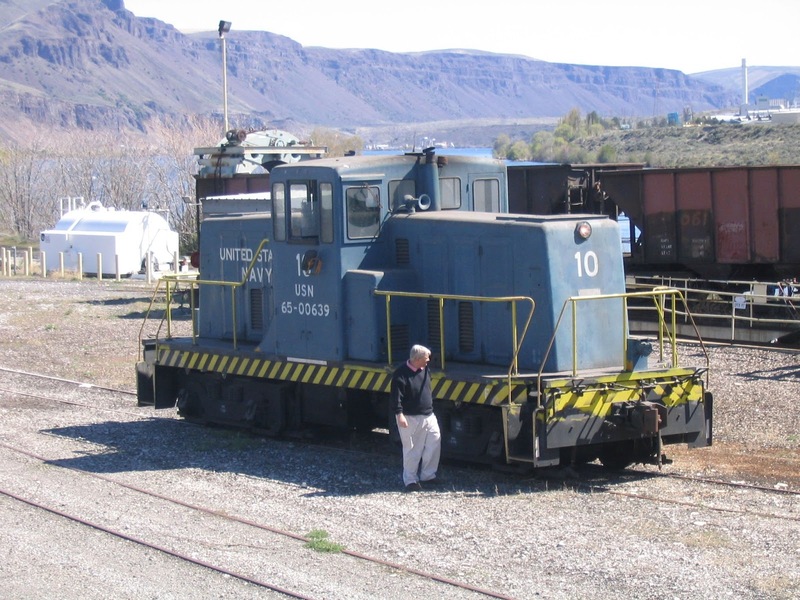 Initially the state cars are only used from the Walla Walla area branches to Portland, later Watco develops a grain shuttle train to a river port elevator near Wallula off the UP main line. 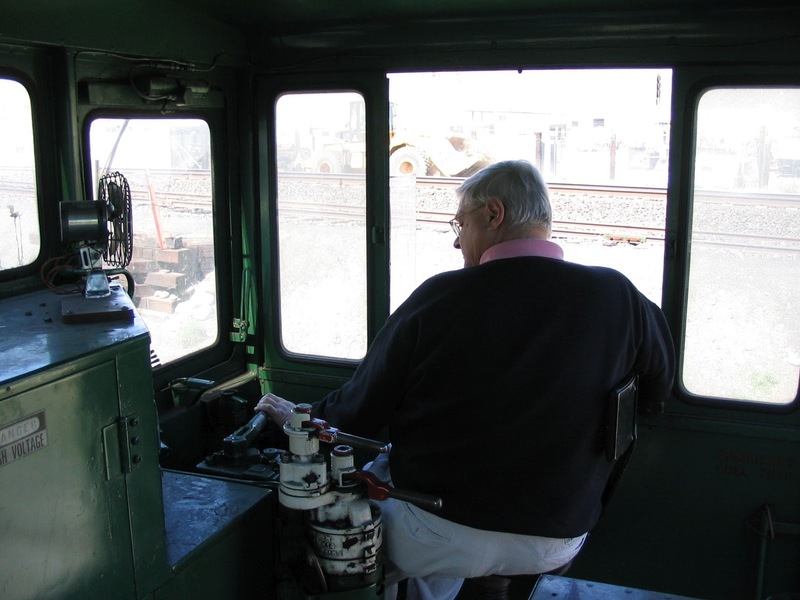 Watco brings in a small group of its own cars for use on the grain shuttle, and use of grain shuttle and state cars spreads to the lines out of Hooper. LINES OUT OF HOOPER--Watco starts up with some good press and even starts a excursion train for one summer (in partnership with a Portland tour operator), but eventually Watco begins to complain about the track conditions (track long neglected by UP) and they begin to have derailments. Watco gets the Port of Whitman County to purchase track maintaince machines in exchange for the "title" to its two Hooper area GP-35's (792, 799 ex-UP exx-WP). Later Watco is able to secure some track repair funds from the WSDOT and the Port of Whitman. Watco does construct a new siding near Hooper to service a gravel pit there and shuttle rock to Pullman for a local contractor. 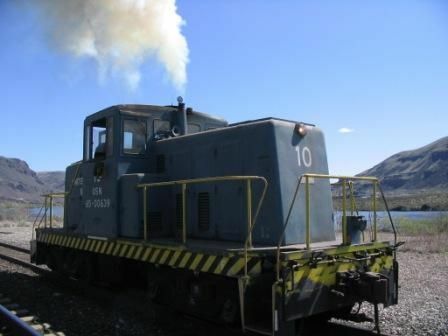 Watco brings in a small group of ex-NW hopper cars for the service---but cars leak badly and service eventually fails. Watco begins to worry about a "headcut" causing a bridge to fail near Pampa, WA and claims to have no money to fix the problem. After a couple of years of exchanges with the Port of Whitman County, the Port of Whitman County buys the bridge in order to gain funds to fix the problem--although there is no evidence anything has been done to stablize the situation. 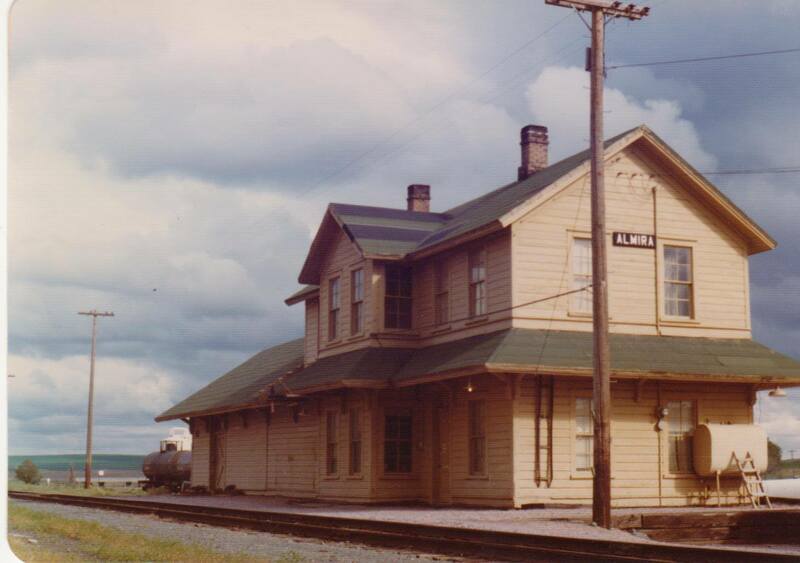 P&L BRANCH, CW BRANCH.--In the late Spring of 1996, Watco forms another railroad to buy the BNSF lines between Marshall, WA and Moscow, ID, (P&L BRANCH) the abandoned but in place Moscow to Arrow, Jct line, the Palouse, WA to Bovill, ID branch (ex-WI&M RY) and the Cheney to Coulee City, WA (CW Branch). 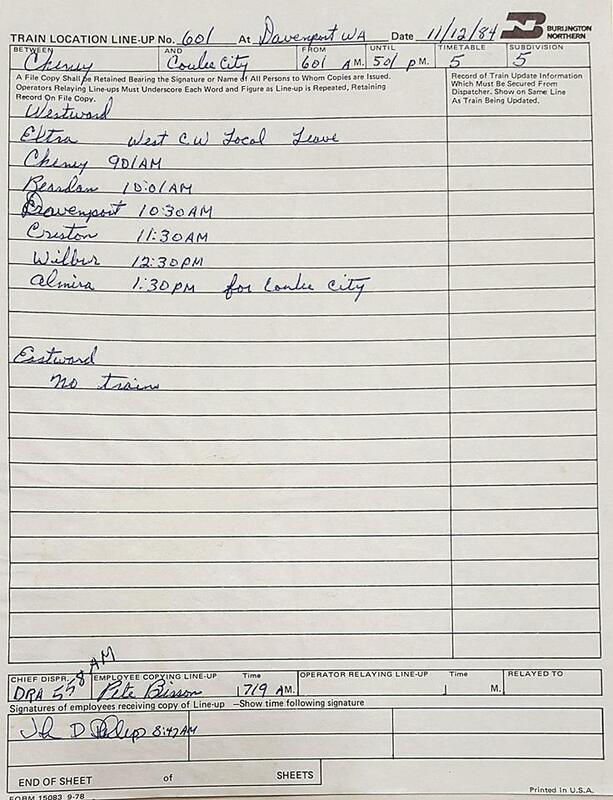 Watco starts the operation with little fanfare and slips faded Xerox letters through the doors of customers that provide shippers with incorrect phone numbers for contacting the railroad. Power and employees are in short supply and service suffers. (Watco purchases additional motive power in the form of ex-CR GP-35's that are in poor condition and several have major problems throwing oil out the exhaust--units are parked in Cheney next to the ADM flour mill and a sizable portion of the white mill is turned black by the oil from the units exhause angering ADM to no end. Watco relocates the units to another location that results in the units leaking into a stream. A group of ex-CSX GP-30's arrive later in better shape.) 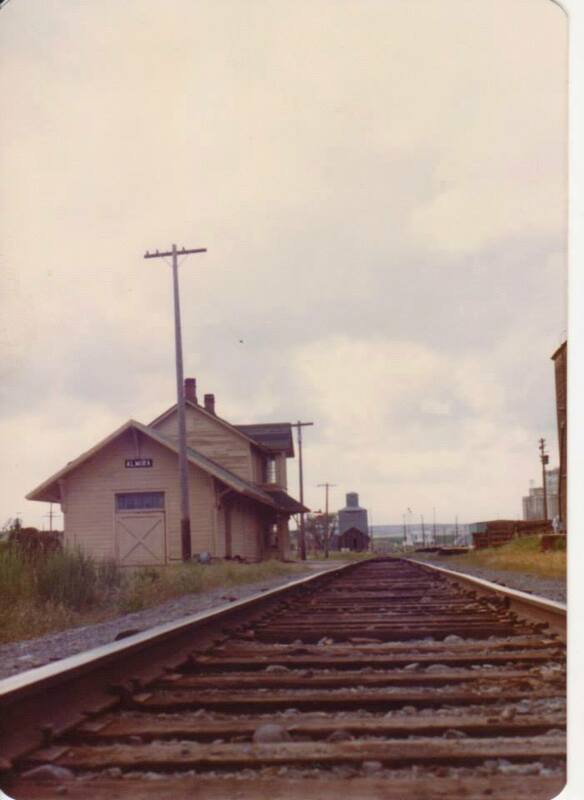 With the Watco purchase of the P&L Branch shippers become hopeful of the reopening of the Moscow to Arrow JCT line in hopes of starting grain shuttle service to the ports in Lewiston,ID. Spring floods prior to the 1996 purchase damage the Moscow to Arrow line and Watco claims it too costly to reopen, later newspapers report that the line had already been sold by Watco to A&K Railroad materials to finance purchase of the BNSF lines. 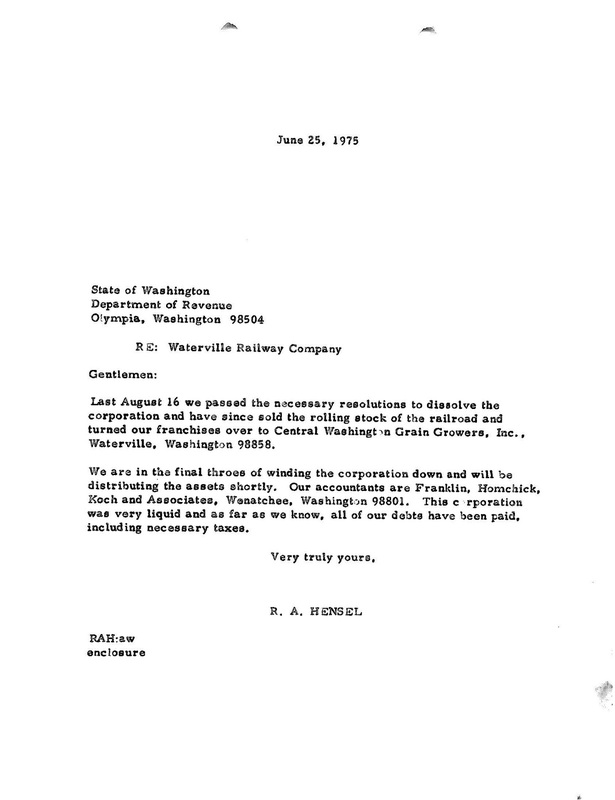 A&K quickly scraps the line for its heavy rail and refused to entertain any offers from others to buy it. Also damaged in the '96 flood was the trackage between Deary and Bovill, ID. (Watco quickly closes the line between Harvard and Deary after a derailment on it's second trip up there.) Another customer celebrates the sale of the BNSF lines to Watco---Bennett Lumber Company near Harvard, ID announces its eager to see the shortline as it wants to ship some of its lumber out by way of UP, resulting in the doubling of its shipments, Bennett's are disappointed to learn that the BNSF sale agreement will still block their access to UP. 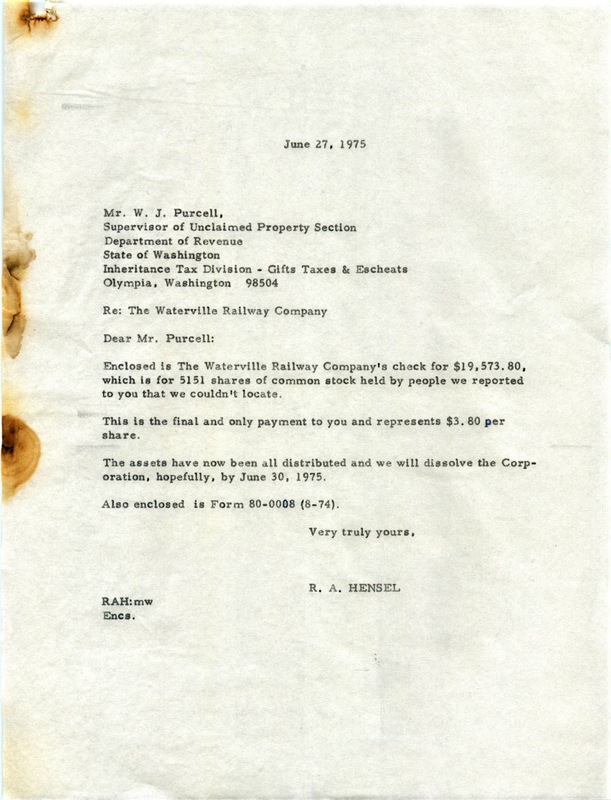 A clay mine is proposed near Bovill, but Watco allows A&K to scrap the line between Harvard and Bovill (in order to pay off a loan made to Watco by A&K), but tells the owners of the proposes clay mine that they would gladly rebuild the line should the mine get built. Watco and BNSF succeed in gaining traffic hauling farm machines to Colfax, but just as the machines arrive, Watco tears out the unloading ramp in Colfax and customer has to stack blocks to unload the machines, later Watco tells the customer to unload the machines in Palouse and truck them to Colfax, but the road between Palouse and Colfax is restricted both due to weight and clearances and customer opts to unload in Spokane. Just after the year 2000, Washington State University begins to plan to replace it's coal fired power plant in Pullman with a natural gas powered on. The WSDOT and area shippers become concerned that the loss of coal traffic (off the UP side of the operation) will tip the scales enough to result in the loss of rail service to the whole area and talks begin with Watco to have the WSDOT buy it's palouse area operations known by now as the Palouse River and Coulee City Railroad (Watco had merged its operations into on common company by then) Walla Walla area lines would not be covered by the sale. Sale takes place in 2004 and Watco gets an automatic 15 year RENT FREE lease on the lines. No other rail operators are permitted to bid for the operation. Coal traffic stops in 2005. 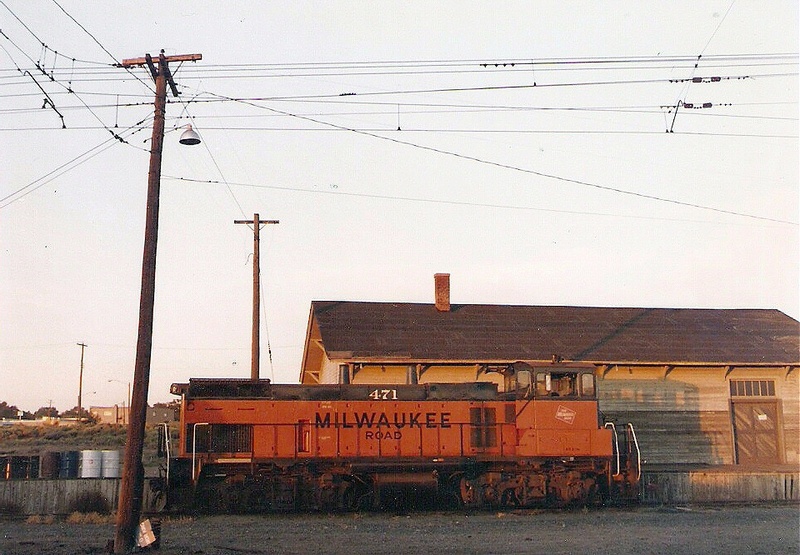 Since 2000, Watco has removed all elevator and team tracks from service on its line between Colfax and Pullman. A salvage company eyes Albion as a reload location for scrap salvaged from the nearby Whitman County Landfill---weeks later Watco crews begin lifting sidings in Albion. Watco get $7.8 million for its Palouse River and Coulee City lines and as part of the deal---for unknown reasons--the WSDOT only wants a 20 foot right-of-way through the City of Pullman and Watco is allowed to sell the land yeilding another $1.5 million. WSDOT does not buy any of the railroad located in Idaho, and in Moscow during the summer of 2005 Watco sells off and scraps 99% of the ex-BNSF trackage in town and some UP trackage to allow University of Idaho to expand it's campus downtown. Some UP trackage is also removed turning Moscow into a switching nightmare with no runaround trackage. At least two shippers lose service in the move (contrary to STB filing by Watco)---Latah County Grain Growers and Columbia Tractor lose service. In 2005, WSDOT awards a feed mill located on the CW Branch a grant to build a large car unloading facility and the company expects to unload 26 car units of inbound feed, also in 2005, BNSF donates it's Geiger Spur to Spokane County and Spokane County begins the public hearings needed to connect the spur to Watco's CW branch between Medical Lake and Cheney in order to eliminate the portion of the spur passing through Fairchild AFB. In November of 2005, Watco imposes a $250 per car surcharge on all cars moving on its former BNSF lines. Watco claims the surcharge is needed to cover revenue lost by traffic being siphoned off by a grain train facility built by CO-AG near Ritzville. All remaining customers stop shipping on the CW Branch and Watco closes down the line in December 2005. But shippers on the P&L Branch tolerate the $250 surcharge and traffic into Moscow actually grows with inbound Lentil shipments. Bennett Lumber company near Harvard announces in too will increase traffic as well from 275 to 350 cars per year. Early January 2006 Watco raises surcharge to $870 per car, and remaining customers immediatly stop shipping. Watco employees are told that the P&L Branch will be shut down completely by May 2006 and employees will be terminated or relocated. Watco has imposed no surcharges on its former UP trackage in spite of the trackage being in much worse condition and prone to derailments. UP has also raised its grain rates so there has been a sharp decline in traffic in 2005, (as well as the impact of the Ritzville CO-AG elevator). Sources for this long winded summary. WATCO, WHITMAN COUNTY GAZETTE, WHITMAN COUNTY PUBLIC RECORDS, LEWISTON TRIBUNE, WALLA WALLA UNION BULLETIN, WSDOT, SPOKESMAN REVIEW, TRAFFIC WORLD, THE SHORT LINE, PUBLIC RECORDS--SURFACE TRANSPORTATION BOARD, JOURNAL OF COMMERCE, CAPITAL PRESS, DAYTON CHRONICLE, TRI-CITIES HERALD, LATAH COUNTY PUBLIC RECORDS, BENNETT AND ASSOCIATES--REAL ESTATE, CASE/IH, thanks to my Uncle Ben in Colfax, and my brother Joe in Walla Walla for helping out sending me info. when I'm not able to be there (Pasco)myself. You'll note that when I got ripped apart a couple of weeks ago for making the same (undocumented) claims, the guys didn't use their names. HERE IT IS WITH SOURCES. Good job, Ted. I wrote the following this morning, but was waiting until later to post. I guess I'll paste it in now. It's not an anti-WATCO piece since I don't have to do that one again. The previous CW thread is starting to get too far down the page and I’m too lazy to scroll down, so I’ll start another one here. As far as I know, WATCO is still running its own grain shuttle down to Wallula using the UP Hooper connection out of the Colfax-based operation. If they are serious about keeping the business that they have or have lost (as long as we are discussing pipedream new lines to bypass the brutal BNSF), there’s another option that might be open to WSDOT: Remove the 10 miles of very good track between Marshall and Spangle and re-connect Thornton (current end of the branch and grain shuttle operation) with Oakesdale (site of some of the north end’s most stable shippers) using the abandoned UP roadbed. That section was severed in about 1990 and is only 7 miles long. I’d then tear out Oakesdale-Palouse (I’m not aware of any current shippers in that section). 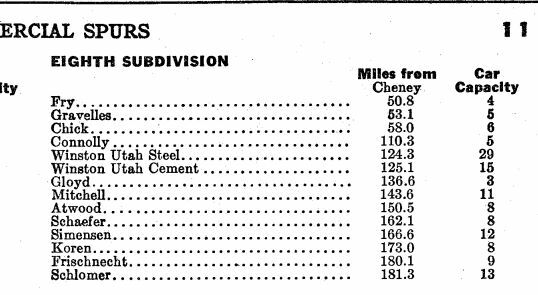 I’m making the assumption that the big elevator at Fallon probably trucks its grain down to Lewiston these days—they were the only shipper between Palouse and Pullman. How many “active” shippers are there anymore at Palouse proper? Is Bennett on the W.I.M. the ONLY active shipper on the south end? 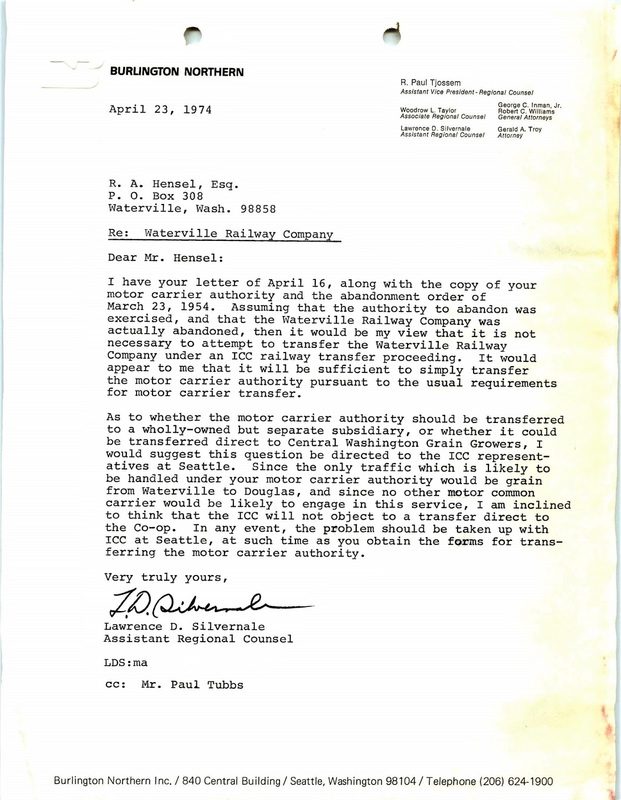 Remember that the viability of the P&L line had a lot to do with the amount of traffic off of the St. Maries River’s south connection at Bovill and that that traffic was cut off by the flood damage to the east end of the W.I.M. At the time, the UP was looking at their Plummer line (the STMA north connection) and seeing the end of traffic out of Wallace and 2 trains a week from STMA/Plummer of about 20 cars each. They are now making 3 trips a week averaging a good 30 cars each. Many of these are now interchanged to the BNSF at Spokane. The P&L became a long, dead-end branch—which is why they spun it off. On the CW line, the problem is that its location makes it the “read-headed stepchild”. The current line could be replaced with a 15-mile relay between Coulee City and the ex-GN mainline at Adrian—which could let the 40 miles between Almira and Davenport (or 50+ if you extend the removal to Reardan come out). The problem is that the BNSF doesn’t want to lug loaded grain trains WB over Stevens Pass, so the cars have to get hauled back towards Spokane anyway, but it does make sense to remove 35 miles of un-needed total trackage. If the BNSF doesn’t want to take the cars down into Spokane and back up to Cheney, put in a connection at the Deep Creek flyover and have the trains use that part of the CW line to Cheney. The first 5 miles of the CW line out to Five Lakes is going to remain in place anyway (even if the entire rest of the line is abandoned) once it becomes the new connection for the Geiger Spur. Fact: There is an on-hold plan to build a shuttle loop on the BNSF mainline somewhere south of Coulee City, so that issue will be solved anyway unless WSDOT decides to spare the highway by considering the 15-mile RR rebuild. I have first-hand knowledge of other long-since removed connections that WSDOT is considering funding, so none of this is outside of possible. Traffic on the CW Branch dried up after Watco imposed a $250 per car surcharge on Nov. 17. Line is now closed due to lack of traffic, and a fan in Cheney told me that the crossing signals on the line have been taken out of service. Some traffic remains on the P&L Branch, but "due to the decline in business" Watco is upping the surcharge to $870 per car on Jan. 6. Most customers have cancelled their cars on order for after that date. Moscow/Pullman Daily News ran a story on the surcharges on 12/23/05 and how Bennett Lumber company is really mad and is going to lawmakers claiming Watco is trying to kill off the railroad. Watco claims that it has to raise rates to cover losses caused by raising rates. Go figure. (If an item doesn't sell at a retail store they discount it or run a sale. 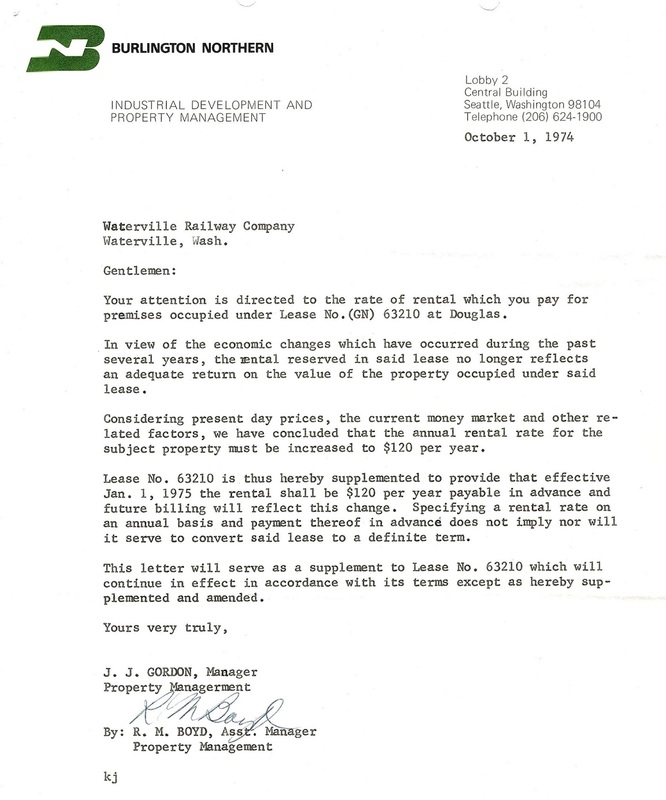 Watco's solution would be to raise prices till it sells given the logic they told the newspaper.) Sadly, I agree with Bennett Lumber, they are trying to kill the lines off. I would think Watco would want to sell the CW Branch to the state and have the state find a different operator rather than go to the expense of a possibly messy abandonment process. I think that everybody would like to see the CBRW get everything that it can. That Moses Lake-Quincy plan is interesting but confusing--bewildering, I guess. WSDOT is somewhat serious about "their" railroads. There is some investment interest in maintaining the Coulee City line by the Feds also due to that line being the only close RR access to Grand Coulee Dam when they need a turbine brought in. I have done track inspections and rehab reports for Chelan County P.U.D. on both of their dams (Rock Island and Rocky Reach) within the past few years. Rocky Reach's spur was fixed in 2002 and Rock Island is scheduled for 2006. In both cases, the spurs were unused for many years and in need of expensive rehabilitation to bring turbines in. Grand Coulee had a couple delivered a few years ago and will need more. They get offloaded at Wilbur and trucked the 20 miles to the dam. The State is also (financially) assisting in the construction of a new spur track for a growing fertilizer (and planning on feed grain) operation at Creston. The problem is that WATCO markets traffic for the line (or at least, they are SUPPOSED to). The main problem on the Coulee City side is that, except for the first 10 miles or so, the rail is old 85# jointed stuff from the 50s. 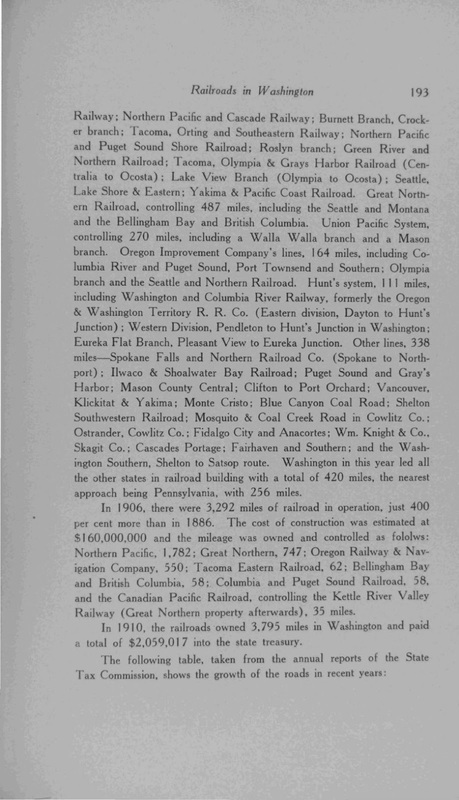 From the book "The History of the Northern Pacific Railroad." 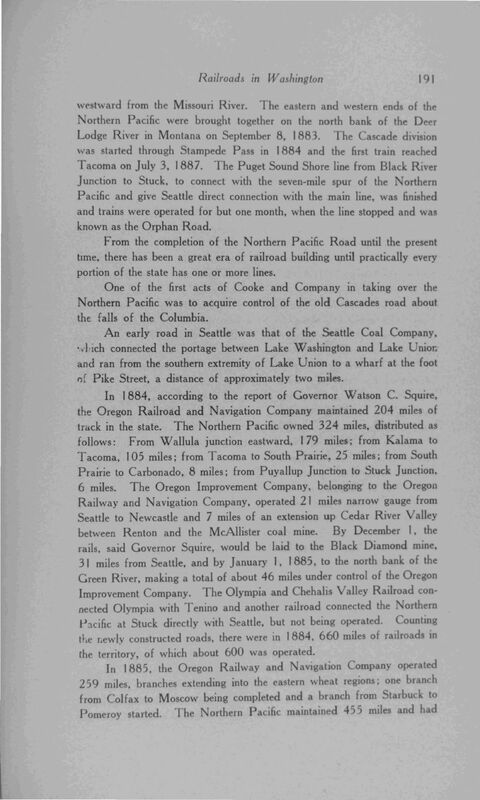 SLSE was incorporated in 1885 by Seattle interests other than the NP. The main route was to be Seattle, Snoqualmie Falls, Cle Elum, Ellensburg, Rock Island Rapids and then Spokane. After the usual money difficulties on January 12th, 1887, a contract was made with the Puget Sound Construction Company for the first 40 miles to Squak. The price was $800,000 in bonds and $400,000 in stock. In early February, Seattle granted a right-of-way through the city and work began on February 25th. The Lake Shore acquired some very valuable waterfront rights in Seattle and on March 25th Kerns Bros. had the contract to clear and grade the first 5 miles from Smith’s Cove. Other contracts were let for the second 5 miles, for piling and trestle work at the Cove and for 5000 tons of rail, 4 locomotives and other equipment. By June the line had been located 75 miles to Snoqualmie Pass. 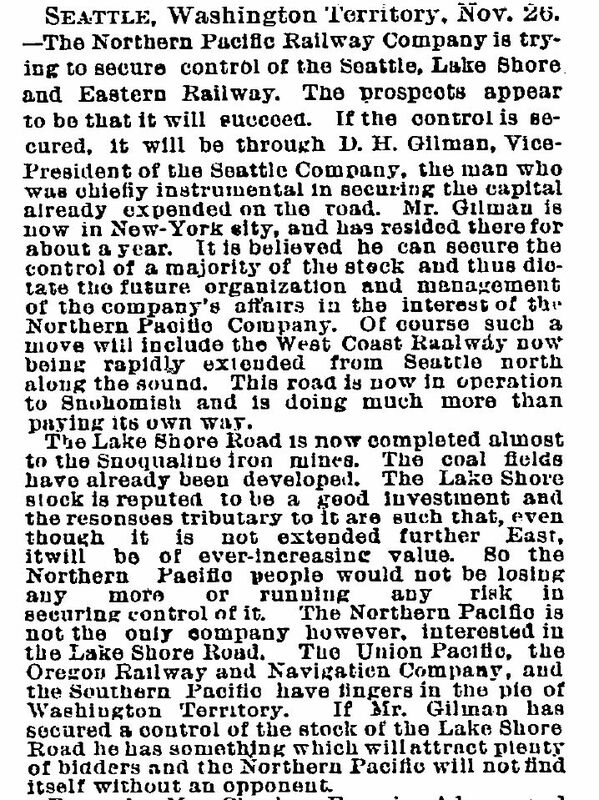 On September 9th the Seattle Press gave a glowing account of the road and its backers plus the Puget Sound Construction Co. A few miles were in iron at the time and 300 miles were predicted for January 1st, 1889. There was a statement that Seattle was hopeful that the Lake Shore would free it from the NP. The article concluded with the indication that Tacoma was non-plussed by this turn of events. All of this journalistic support could not overcome the problems associated with a change in control, a change in the construction company and money difficulties. It was not until July 16th, 1888, that the first regular train ran from Seattle the 24 miles to Woodinville. 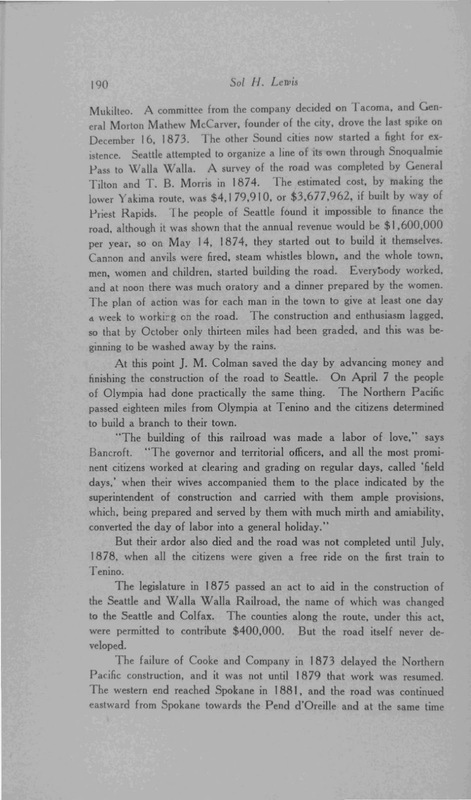 In early December of 1887, the Seattle and Eastern Construction Co. was incorporated to build the road for the Lake Shore. Four New Yorkers, T. Burke, Angus McIntosh, F.M. Jones and W.H. Scott were behind the venture. Their new organization finished the 20 miles from Woodinville to Sallal Prairie in the Cascades and that was as far as the line ever went. 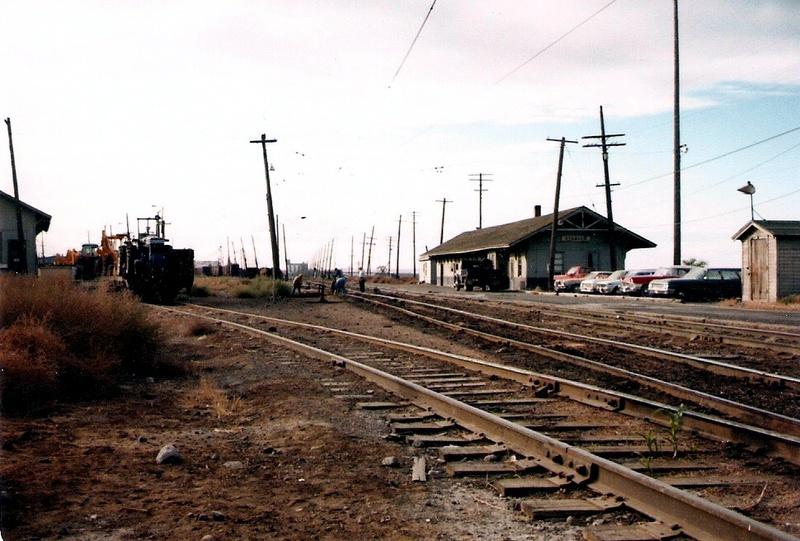 They began the connecting work west from Spokane in early 1888. Forty miles were planned to be ready for the fall harvest. Twenty miles of grade were in by July but here again lack of funds only saw 10 miles of track by November. The next few months were more productive and the line was open 45 miles to Wheatdale in mid-March, 1889. Then money problems became acute, the town of Davenport offered to grade the 5 miles to reach there. This was accepted and completed so that in October the eastern section consisted of the 50.05 miles from Spokane to Davenport and that was as far as that line was to go. The major segment of the Lake Shore was not in the original planning. As the possibility of a Cascade line became remote a line to Canada became more appealing. 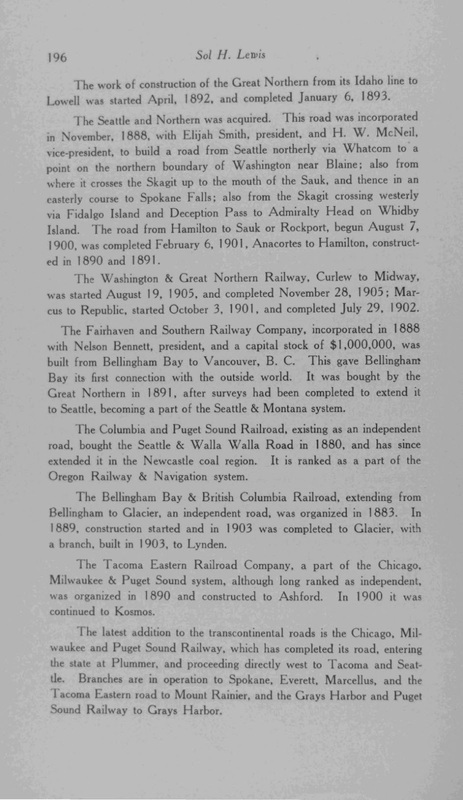 On March 24th, 1888, the Lake Shore purchased the Seattle and West Coast Ry. That company had 14.4 miles of graded roadbed from Woodinville north to Snohomish. F.H. Whitworth of Seattle started work on this northern branch and by the end of April an easy route was located all the way to the Canadian line. December saw 20 miles in operation on this branch. Funds needed for the Canadian line would be large so the Lake Shore increased its stock to provide a bonus for bonds to be issued. In April, 1889, it was reported that $2,000,000 would be offered. The surveys had been run from Snohomish to the Skagit River in 1888 but the end-of-track remained 6 miles north of Snohomish for many months. In 1889 the surveys were completed to the Canadian line. Earle & MacLeod were the contractors for much of the work. They put the Lake Shore in and out of receivership in order to collect $87,000 for previous work. When $90,000 in bonds were posted all was well. During the year the first 15 miles south from the line were cleared and also the 15 miles south from the Skagit River. Clearing was very difficult due to the heavy timber. The maximum grade was held to 1.5% and there was much bridging for all the streams and rivers flowed west from the well-watered Cascade Range. In Spokane during February, 1890, bondholders applied for a receiver and for an injunction to prevent giving the Seattle and Eastern Construction Co. any more securities. There were implications in the papers of the time that the NP was behind this suit. It was transferred to Seattle and denied in early March. In june reports began that the NP had control of the Lake Shore due to its valuable Seattle Harbor franchises. 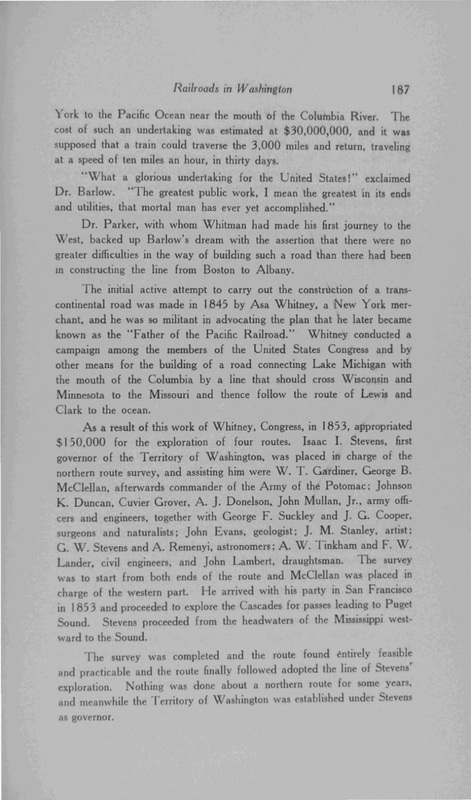 Thomas F. Oakes, a member of the NP board of directors, denied this but stated that the two companies were going to coordinate the construction of a Lake Washington Belt Line and in July the NP had the firm of Henry and Balch of Minneapolis working on the 20 mile section of the belt line east of the lake. The NP had been surveying here the previous February. In July the Oregon & Transcontinental, a holding company organized by Henry Villard in 1881, purchased a majority of the Lake Shore stock for $45 per share, $2,335,000 of the $4,150,000 outstanding. 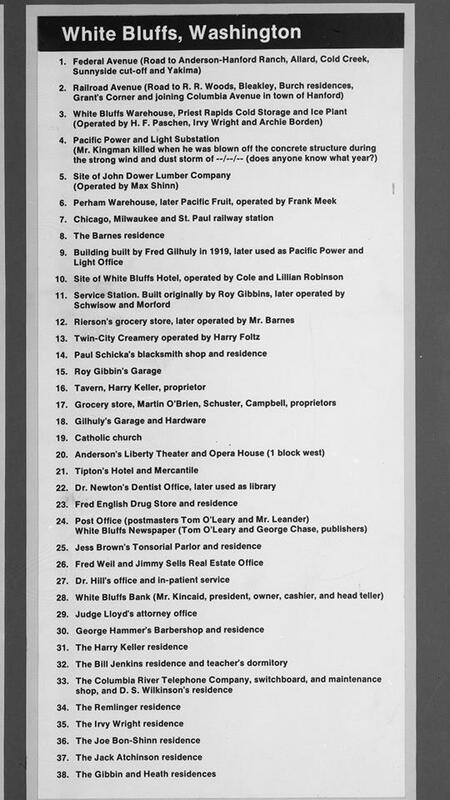 Oakes had to reverse himself stating on the 22nd that $3,000,000 of the stock had been purchased and the road leased for 6% on the bonds and a $300,000 rental. Traffic north of Seattle apparently was heavy enough to cover interest charges. At the time one major reason stated for this action was that James J. Hill of the GN wanted it. To finish the construction story of this branch we find 500 to 700 men working at tree different sites during 1890. In May track was 30 miles north of Snohomish and on August 1st the San Francisco Bridge Co. completed the Stillaguamish bridge at Arlington, 61 miles from Seattle. 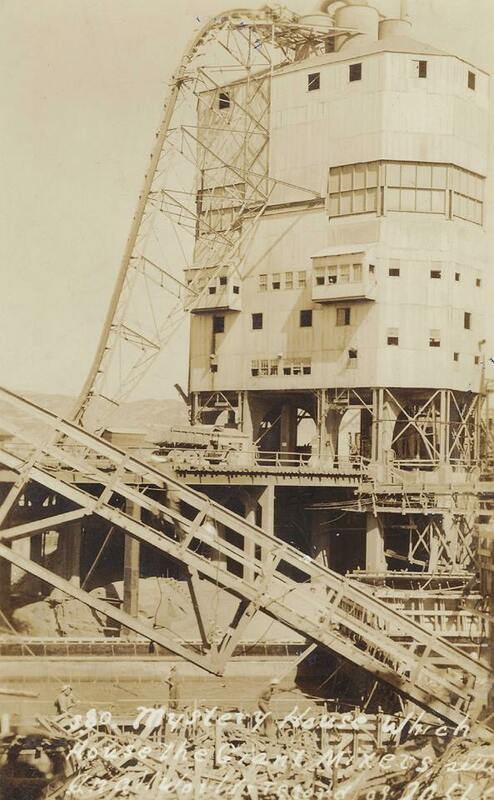 This 240 foot drawbridge with its 4000 foot pile trestle approach had held up progress for a long time. Heavy rain and the lack of skilled labor had their part too. The longest uncompleted section was now the 21 miles from Arlington to Sedro including the Skagit River bridge at Sedro. This was a 650 foot combination drawbridge with a 4800 foot pile trestle on the north and a 2305 foot trestle on the south side. In December trains were running between Arlington and Sedro and the grading was finished to the boundary. 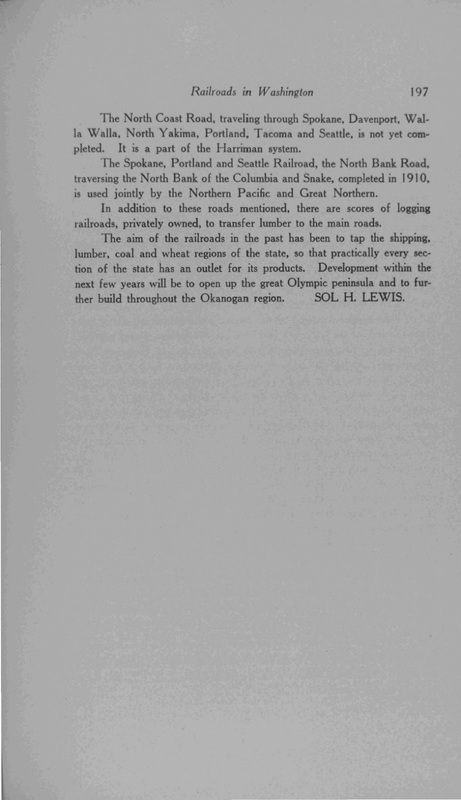 April 10th, 1891, the road was open Seattle to Sumas which was one half mile south of the Canadian line. During June, 1891, Traffic Manager J.M. Hannaford assumed similar duties for the Lake Shore and on May 1st, 1892, operations were consolidated with those of the NP. On March 31st, 1893, a Lake Shore stockholder started a suit to have the NP lease annulled and a receiver appointed. A receiver, T.R. Brown, was appointed on July 7th, but the NP traffic contract was continued and the NP operations were continued. The Lake Shore came out of the receivership as two companies both operated by the NP. The NP built a branch to compete with the eastern section of the Lake Shore. It was called the Central Washington. NP records indicate that between December 6th, 1887, and February 25th, 1888, surveys were made and a line located diverging from the main line at Cheney and extending westward through portions of Spokane, Lincoln, and Douglas counties across the middle crossing of the Grand Coulee, a distance of 115 miles. It was a very good line, under 1% grade, with light work except for some areas where the rock came to the surface. The area was rich and fertile second only to the Palouse. To forestall the Lake Shore line, the NP put G.W. Hunt to work here grading five miles through Grand Coulee in early summer 1888. This action along with the other Lake Shore problems was sufficient to allow later Central Washington construction. Aside from the Grand Coulee work Wilson & Glenn, the contractors, did little in 1888. During 1889 the road was completed the 46 miles to Almira and a contract for the additional 15 miles to Grand Coulee was let. By May 30th, 1890, grade and bridges were completed for the entire branch and by July 1st the track was in. When the NP acquired control of the Lake Shore in 1890 it had two branches into the Big Bend country and both could not be supported especially as the Great Northern was to be entering the region shortly. Despite this fact the eastern section of the Lake Shore was not abandoned until well after the turn of the century. 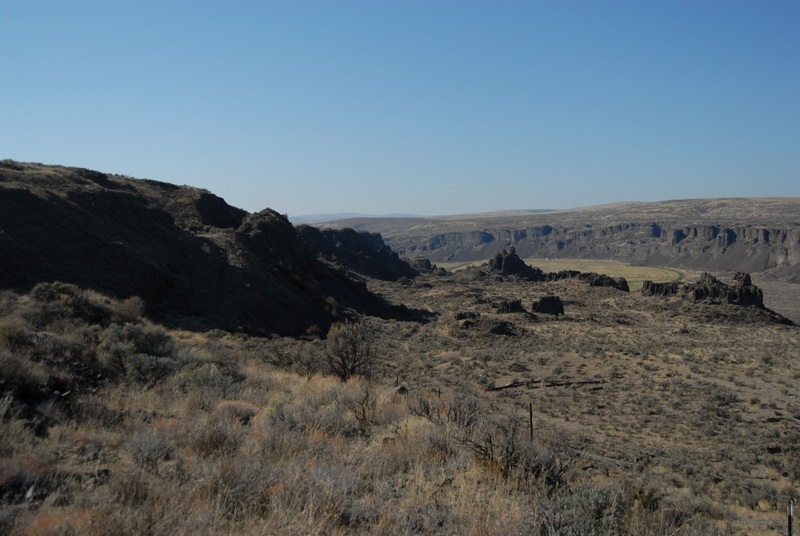 The annual meeting on October 16th 1890 it was announced that the Central Washington entered the Big Bend country of Washington and would be extended to the Okanagan mining area later. At the annual meeting on October 20th, 1892 a stockholders committee was organized to investigate the affairs of the NP. In Washington critical note was taken of the relationship with the Lake Shore, the eastern section paralleled the Central Washington and was relatively useless. In the western section only the line from Seattle to the Canadian line was considered worthwhile. 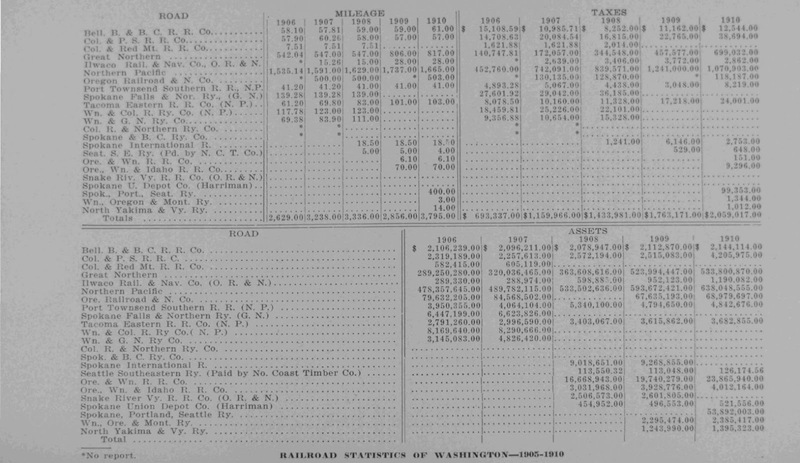 The NP had purchased 31,626 ½ shares of 41,500 outstanding at $45 each on May 23rd, 1890 and between July 1st, 1890 and June 30th, 1892 the line was run at a deficit of $584,300. 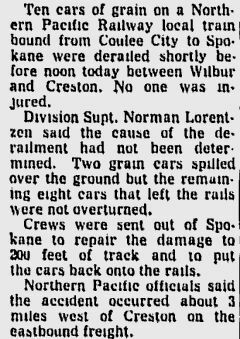 To argue that the Lake Shore was needed to deter the Manitoba (St. Paul, Minneapolis, and Manitoba RR-forerunner of the GN) did not hold for it did not do so. The Lake Shore was purported to have started as a land speculation and then money speculators got the bonds at 80 and the stock as a bonus. The NP purchase included a bond guarantee and this would have been very beneficial to the speculators if all was true. The Lake Shore had an operation loss as of June 30th, 1893 of $257,701. Before the NP entered its second reorganization of the mid 1890s, the Lake Shore had its lease terminated. 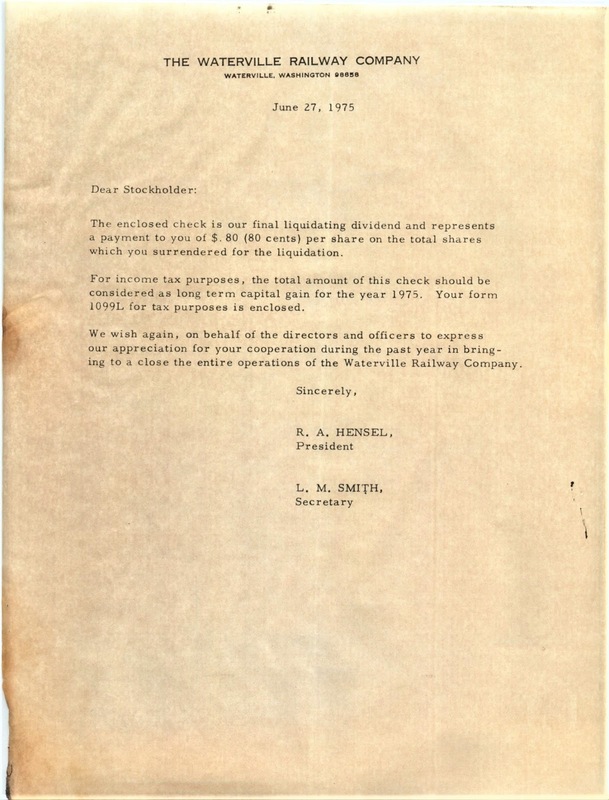 The Congressional Charter of the NP had many valuable rights and privileges contained in its franchises and the reorganization committee had applied to Congress to have the old NP charter applied to the new NP company which they planned to use in the first plan of reorganization. However, due in part to the strong opposition of the bondholders of the Lake Shore, Congress took no action. Another charter would have to be found for the new NP company. The Lake Shore was leading a separate existence during the NP receivership. Its lease had had been given up shortly before the NP receivership and it had gone the bankruptcy road too. 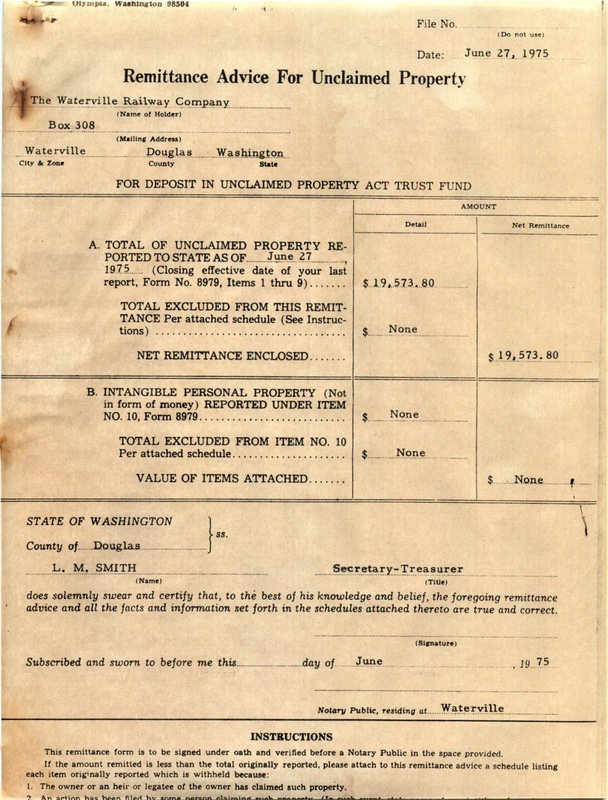 There had been continuing litigation between the NP and the Lake Shore as to who was indebted to whom and the NP was trying to prevent a foreclosure. 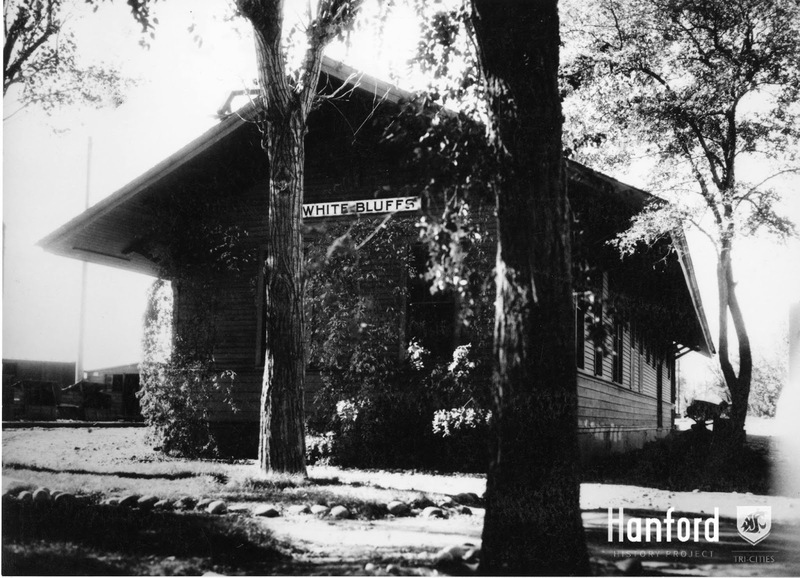 However, on March 31st, 1896, Judge Hannaford ordered foreclosure sale on May 16th and the bondholders agreed to this on April 10th. The Lake Shore was thus sold to its reorganization committee on May 22nd for $1,000,000 and the sale was confirmed on June 9th although Circuit Court approval was delayed until February, 1897. The road began anew with the profitable western section as one railroad and the useless eastern section as another although they both had the same officers. On July 11th the old bondholders of the Lake Shore began a general creditors suit in Milwaukee to forestall the NP sale as they claimed that the general creditors had been left out of the reorganization. The case was argued on July 21st and denied on the 22nd. Likewise the reorganization committee for the Lake Shore stated on July 24th that there was no NP lien as it came after the first mortgage and the road had been sold under that mortgage and thus the NP lien was against a defunct road. It was several years before these two independent roads came back into the NP fold. The NP had been behind the long delay between the sale of the Lake Shore in May, 1896, and its final court confirmation in February, 1897. This was because the NP owned $3,162,650 of stock and $1,258,691 of bonds in the company and the sale price was only $1,000,000. 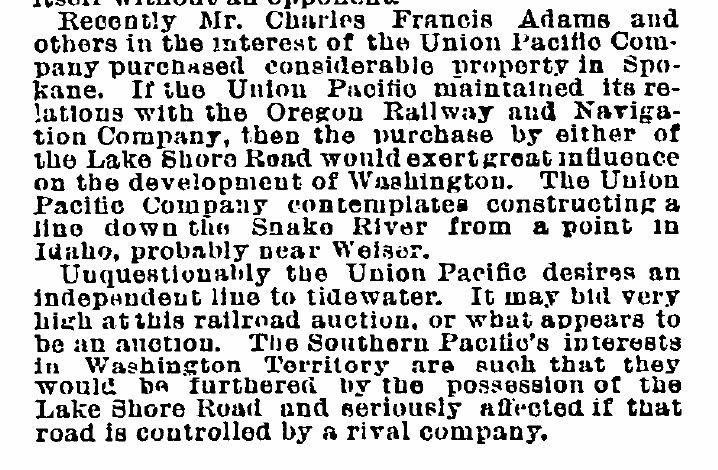 After the confirmation of the sale the western section of the Lake Shore, which was the part of value, passed to a company called the Seattle and International on July 10th. This company had been formed earlier in the summer for just this purpose. 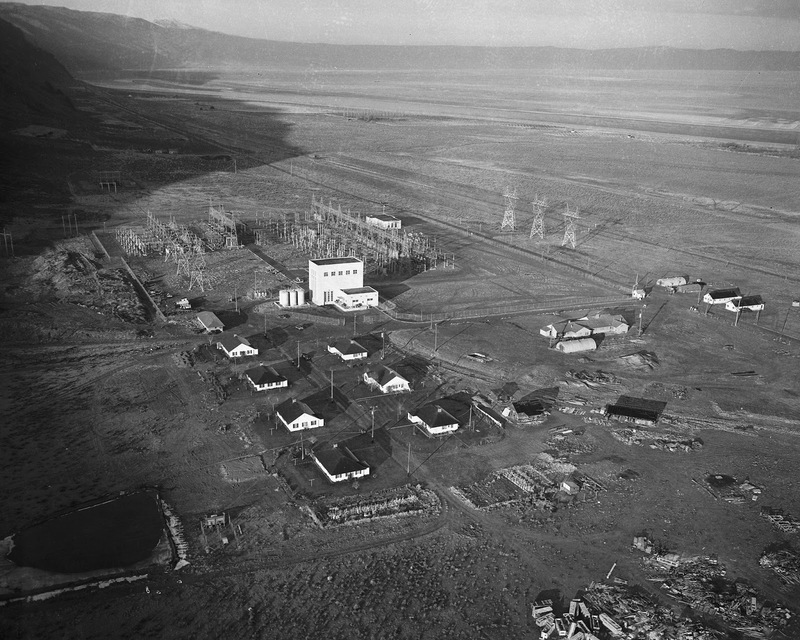 During January, 1898, the NP bought $5,558,000 of the bonds of the S&I and displaced the reorganization management. 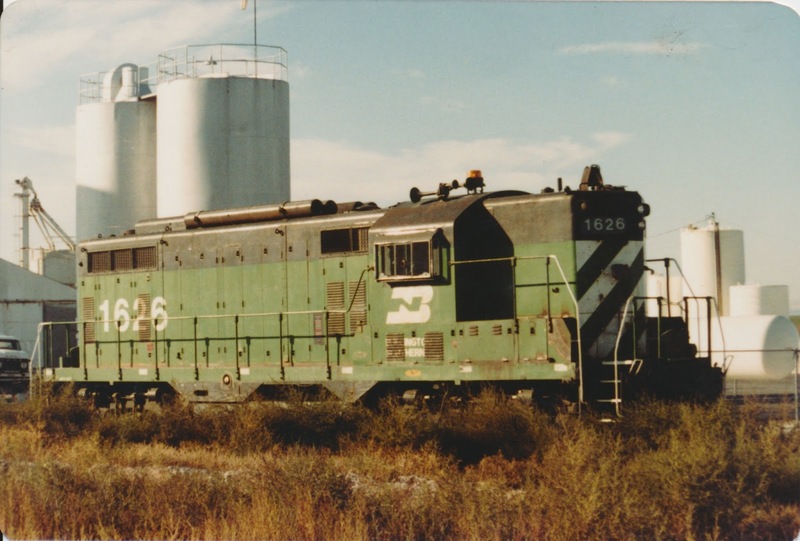 Not only did the NP want to keep this line out of any rival hands, the Canadian Pacific was rumored to be bidding on it, but also one of the Lake Shore reorganization groups was trying to assert a large claim against the old NP RR. This purchase stopped this action. At this time the line consisted of the 125.3 miles from Seattle to Sumas, the 38.6 mile branch into the Cascades from Woodinville to Sallal and valuable terminal properties in Seattle. The GN began using the Seattle train station on March 20th, 1896. The Klondike Gold Rush was providing much business at this time and May 20th the NP traffic department absorbed that of the S&I. In February, 1900, the NP bought, using the S&I, the western section of the Everett, the western section of the Everett & Monte Cristo, from Snohomish to Everett, 11.5 miles and terminals. The property was leased until the title was cleared. 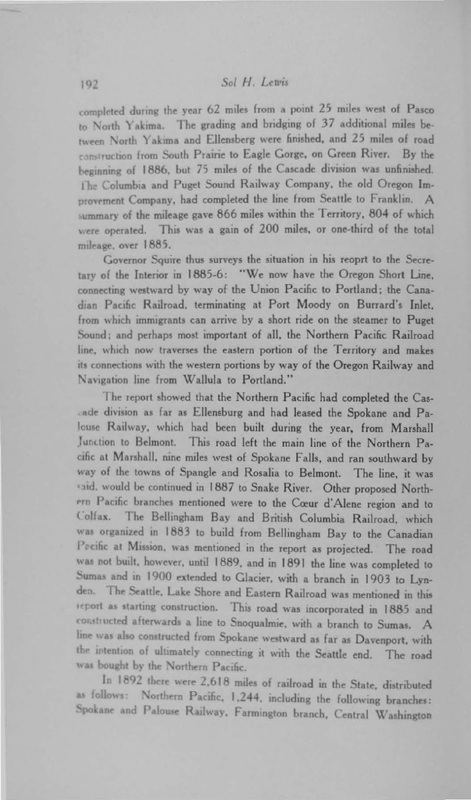 In April, 1900, again using the S&I, surveys began between Arlington, on the Sumas line, and Darrington up the Stillaguamish Valley in the Cascades. This was through very fine timber country. Right-of-way was secured in June and the contract was let in July to Larson & Greenough. The last rail was in by the end of May, 1901. Meanwhile, on March 21st, 1901, the NP purchased the S&I outright and these two newer sections came with it. The eastern section of the Lake Shore was also acquired on July 10th, 1896 by a new company called the Spokane and Seattle. Its officers were the same as those of the S&I. 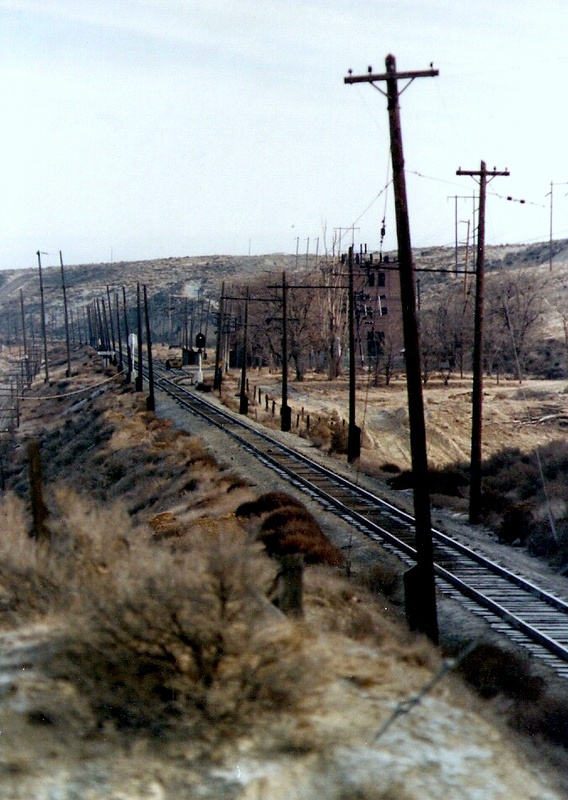 The 50 mile line from Spokane to Davenport was alswys operated by the NP. It closely paralleled the Washington Central, successor company to the Central Washington. This latter company had been sold at Spokane January 19th, 1898, and bid in by the bondholders for $100,000. The NP acquired all of the capital stock and leased it in March. 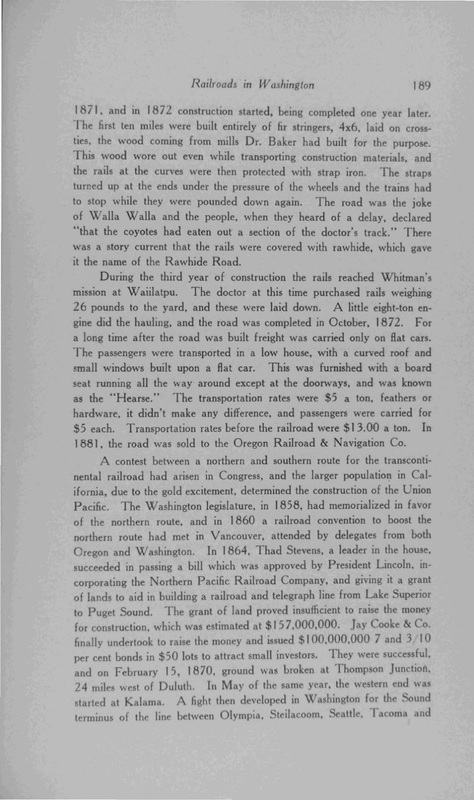 In March a year later the NP purchased the Medical Lake-Davenport section of the S&S, and in October, 1900, the Spokane-Medical Lake section. 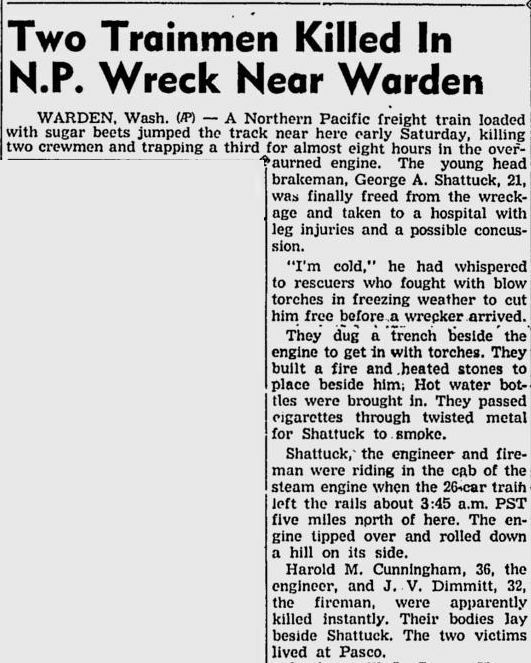 Along with the purchase went the abandonment of the 29 miles from Spokane to Ditmar which was the section paralleling the Washington Central. 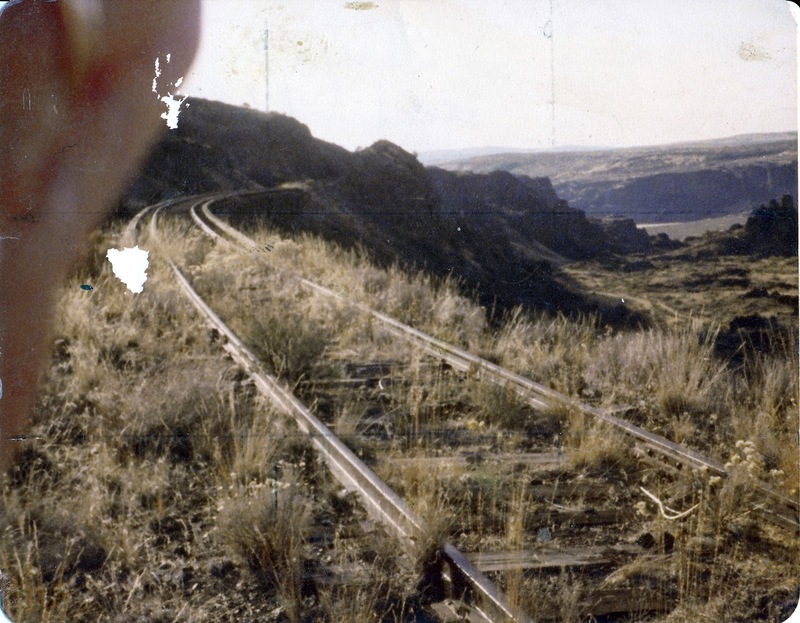 No better example of railroad over-expansion and disregard of sound business principles can be found than that shown with the Central Washington and the eastern section of the Lake Shore. The Washington Central was later extended to serve much of the Great Bend region of Eastern Washington and became a very fruitful branch. 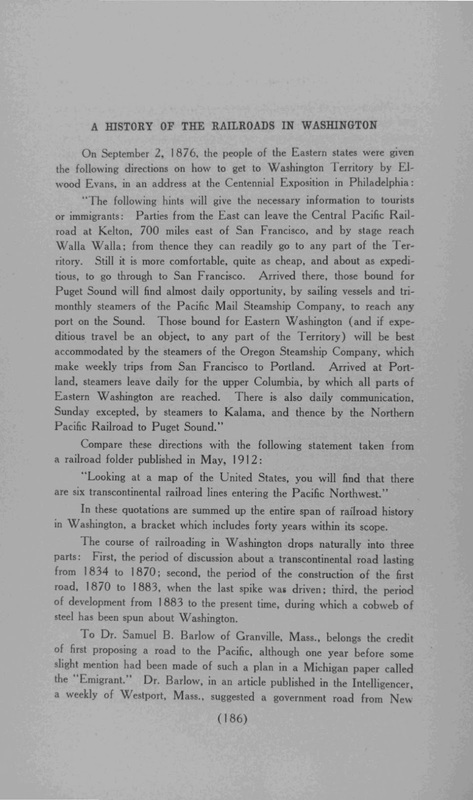 In August, 1902, the NP decided to extend the Washington Central to connect with the GN main line west and thus possibly give another quicker line to Puget Sound. In May of 1903 Larson & Foley of Spokane started track laying from Coulee Jct. and the 21 miles to Adrian on the GN were ready September 11th. Five years passed and in July, 1908, a line from Adrian to Connell, on the NP main line north of Pasco, was considered as a joint venture by the NP-SP&S-GN. 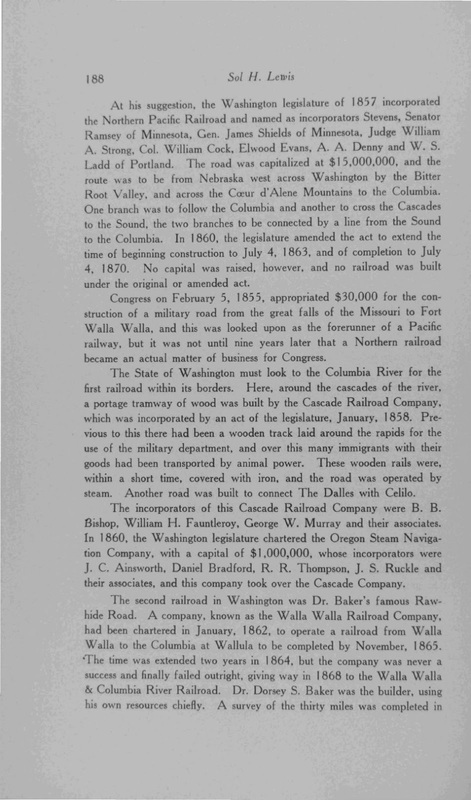 There was no action so in June, 1909, the NP incorporated the Connell Northern and by November 1st, 1910 the 73.5 mile line Connell to Adco had completed the big loop through the Big Bend of the Columbia. 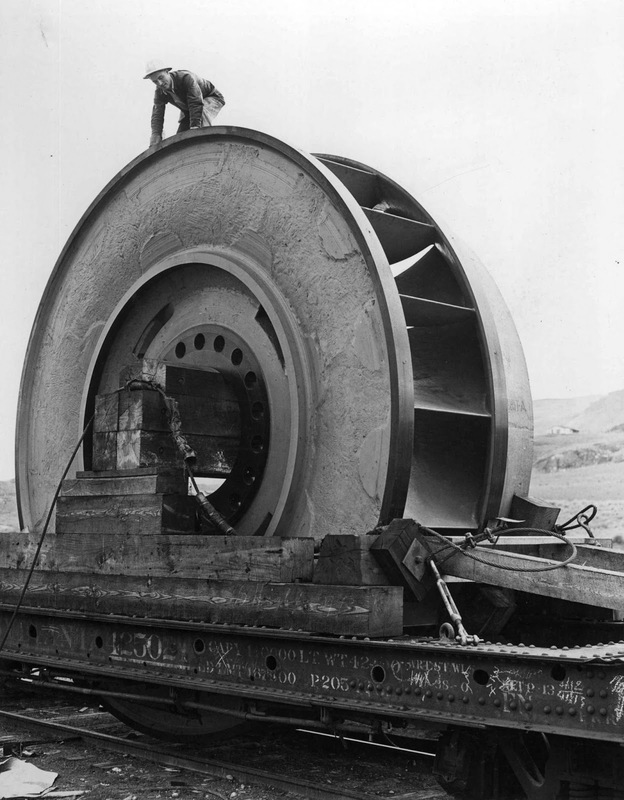 This was to be a very valuable feeder to the NP in later years after the completion of Grand Coulee Dam and the Columbia Basin Project. From a 1948 NP Idaho Division Timetable. Thanks to Ted Curphey for coming across this link for information about the spur being named for the Bacon Siphon contractor, T.E. Conolly, Inc. This location is about 3 miles due south of Coulee City. See this location today here. 1978 view is a Dorothy Kimball photo, courtesy of Mike and Penny Kimball. Bridge #118 location. Dorothy was likely getting the picture to paint a version of the scene later. Courtesy of the Lincoln County Museum. Thanks to Fred Simon for bringing this to my attention. This is the 3,000th posting on this website. Back in late 2005/early 2006 I had an email exchange with the late Alan Eisenberg. This was before I started this website by about a year and I was realizing I had a lot of information, but lacked so much more. I reached out to Ike and asked him some questions, which I did not save. All I have are his responses. I did provide him some information for the track charts he was working on, which documented every single piece of track the BNSF ever operated, even via long-gone predecessors. He managed to come out with a 10th version of his track charts before his passing. proofreaders, but even then, something is bound to slip by. started as the Seattle, Lake Shore and Eastern." before any more rails were laid. When I researched the MILW segments, MILW in 1919 had over 500 "roads"
granted a franchise or something, to be sold later. Tillamook line is so long to Tillamook rather than a more direct route. three, and four times before being incorporated into the present system. Roger's Frisco which had some roads that didn't. others, like the Overton books, and another specific book on Iowa. So, in sum, what might have been, may never had gotten off the ground. NP's Yacolt Branch was to connect with the White Swan branch, over Mt. they bought or were granted the land, in case, even lying dormant. Lake). There is a plaque on the Pass commenmorating his efforts. Like I said in my post, research can be intereesting. but no one seems to want to operate it and to where? Any shippers left? economically depressed area to bring in companies that failed? just had the rights, but I don't know how true that is. already there. Interesting to say the least. names section). So, I would think it was different than NP completely. 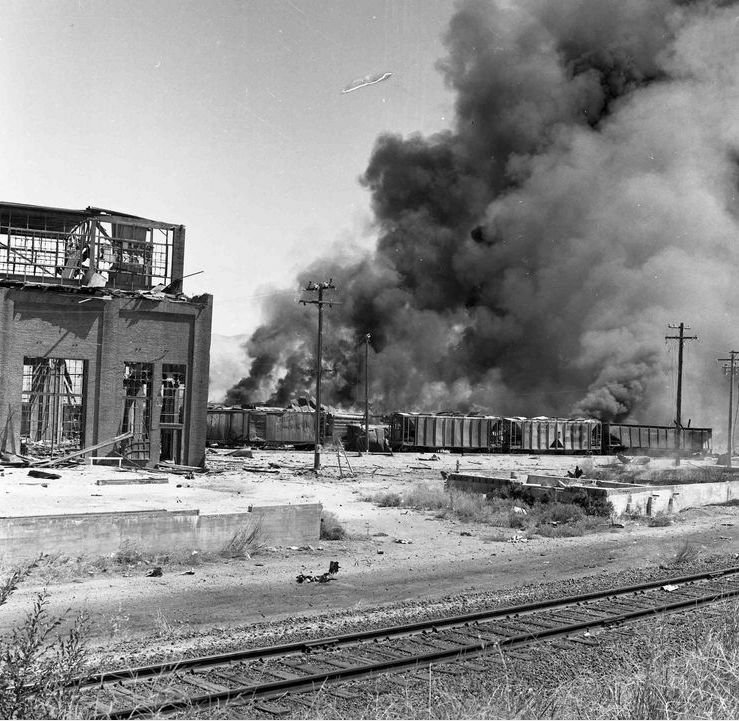 "converted to a steam line", meaning electric operations ceased. well as Bertha Blvd itself. 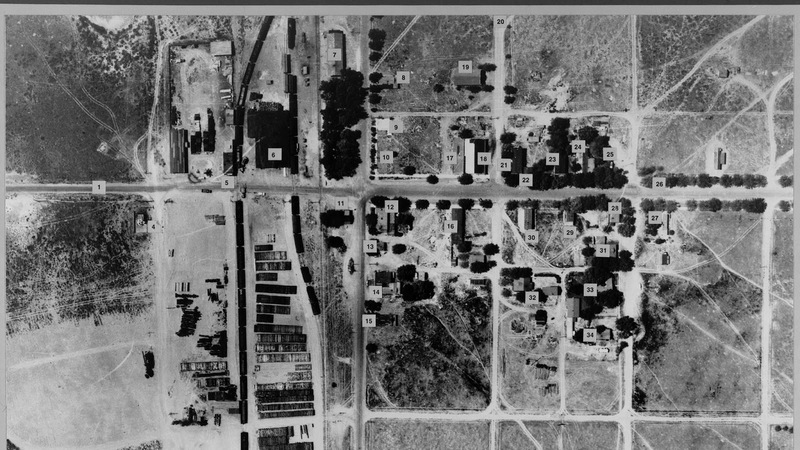 Courtesy of the Hanford History Project. Photo courtesy of Fred Simon. Fred Simon, a conductor on the Eastern Washington Gateway, skillfully took these photos and put them together for the annual Autumn Leaf Slide Show. He received so many requests to view it outside of his group of friends he graciously uploaded it to Youtube for others to enjoy his magnificent work. See his video on Youtube here. 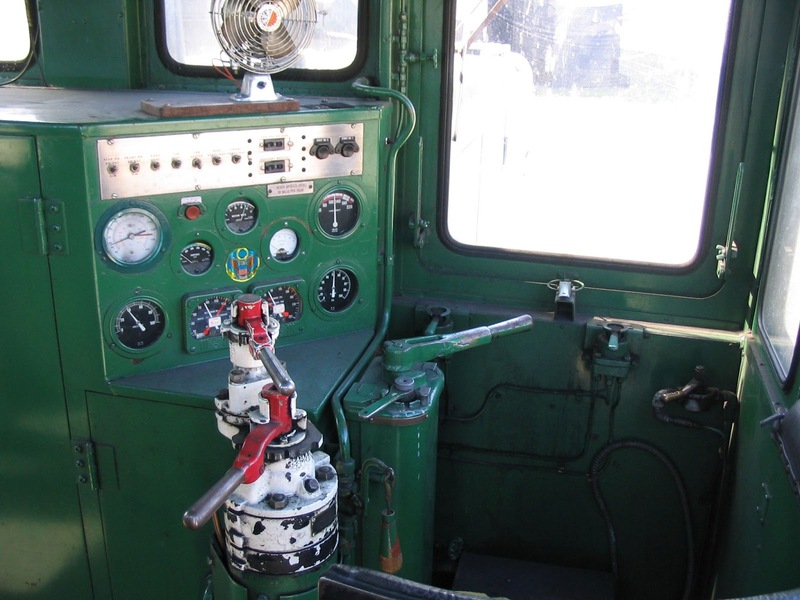 Built in October 1952 as US Army 1669 and stationed at the Ogden Transportation Corps Depot in Utah. Also served at Elgin AFB in Mossyhead, Florida. Then went to Carswell AFB in Fort Worth, Texas. From there is moved to Fairchild AFB at Spokane, Washington before being transferred to the US Navy and being assigned 65-00639 and serving at the Puget Sound Naval Shipyard at Bremerton, Washington. Sold to American Silicon Technology/Silicon Metaltech. Pictures taken April 9, 2007 at the Rock Island Silicon Metaltech plant. I don't know if it is still on the site. Photos by the late Ross W. Sterling. 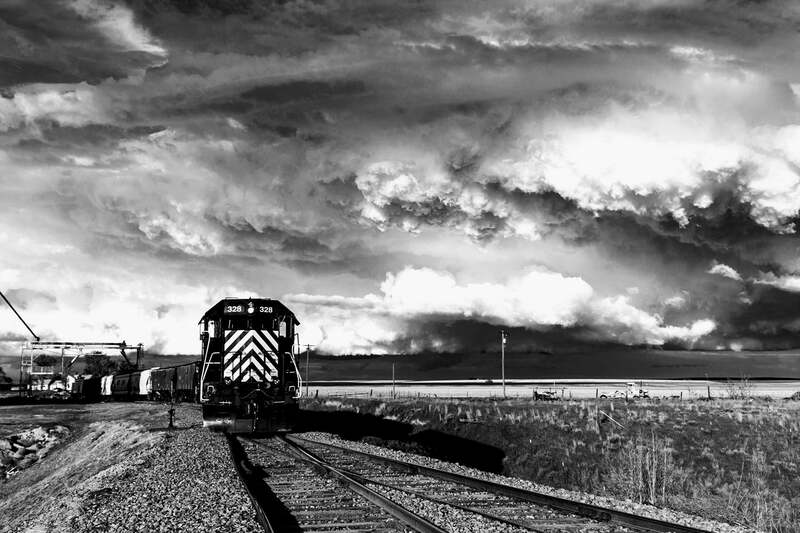 I had asked him about using one of these photos in my book, Big Bend Railroads, during the time I was collecting images. 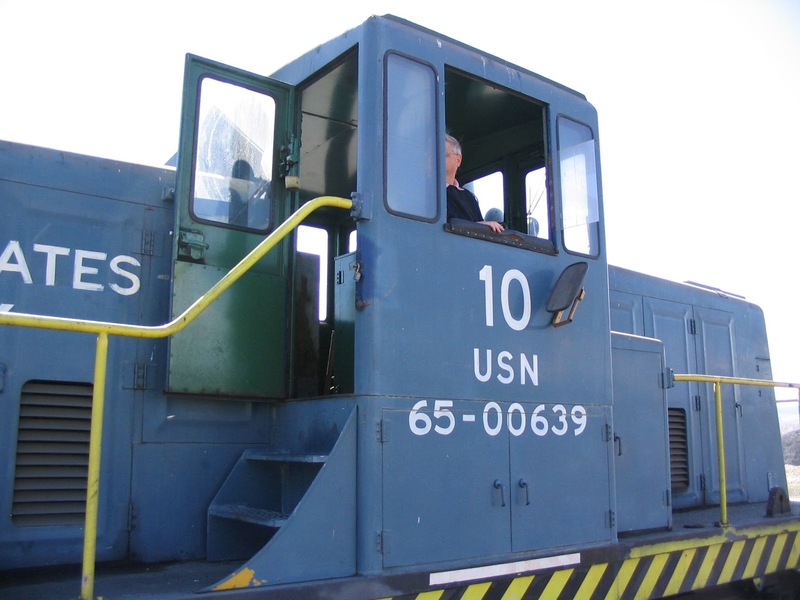 I recalled seeing it in his garage years ago in Moses Lake where a small bunch of us hung out weekly to work with Ross' trains, though it was usually a bull session with only an occasional train run. Anyway, Ross couldn't recall anything about it the photos when asked, as his memory was slipping. Now that he has passed, I was asked to help appraise his remaining model train collection. And there they were. The pictures I sought. Next to the HO scale model he built of this engine. Finding the photos seems to hollow, now that my friend is gone.